Is a Miami bounce in the cards? Heading into the Miami International Boat Show - the largest of the U.S. winter shows - exhibitors are generally optimistic. No one expects to set records, but with consumer confidence up and a general feeling the economy is rebounding, many think the show will surpass 2009 in turnout and sales. "Essentially, I think that Miami&apos;s going to be a good show, certainly better than last year, because the companies that have gotten through the misery of the last year are stronger and more efficient," says Jock West, a spokesman for Trumpy Yachts, which will be showing either the builder&apos;s 63-footer Showtime or a 72-foot model. "So they&apos;ll go to Miami utilizing those efficiencies, and they&apos;ll make more money on each sale because they&apos;re not wasting money. "The consumer&apos;s going to be cautious, but he&apos;s going to be there. Last year, I don&apos;t think he was even there," West says, adding that by early January, Trumpy had six appointments set for the show, compared with two last year at that time. The 69th annual Miami International Boat Show and Strictly Sail Miami runs Feb. 11-15 at the Miami Beach Convention Center and Sea Isle Marina & Yachting Center. 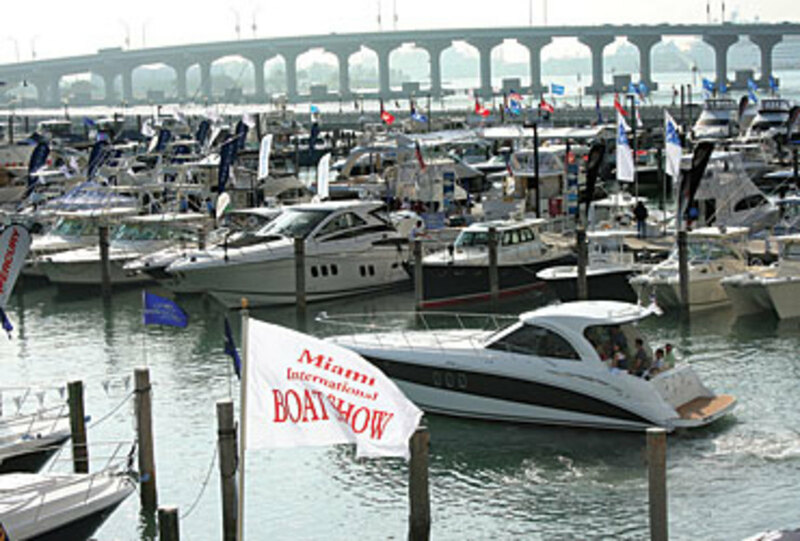 Running concurrently is the 22nd annual Yacht & Brokerage Show, the in-water-only display on the Indian Creek Waterway along Collins Avenue. Around 2,000 exhibitors are expected at this year&apos;s show, according to show manager Cathy Rick-Joule, vice president of Southern shows for the National Marine Manufacturers Association. While that number is down about 200 from last year, Rick-Joule says the NMMA had expected the decline, and the changes enabled some exhibitors to move inside the convention center for the first time and others to expand booth space. Nautic Global Group, for example, will be able to show its Godfrey and Rinker brands together for the first time. "The convention center spaces have shifted around tremendously," says NGG marketing director Steve Tadd. "That opened up some opportunities for us, and we jumped on an all-new space that was much bigger than we&apos;ve had in the past. There are decades that go by where these opportunities don&apos;t come up. Nautic Global Group looks at Miami as something worth investing in." NGG is planning boat show specials, including one that donates money to Project Healing Waters for every boat sold through the end of March. Project Healing Waters provides fly-fishing experiences for wounded combat veterans and others with disabilities suffered in military service. In another promotion, the company says it will plant a tree for every boat sold during the same period. NGG chief sales officer Rick Gasaway says the builder will launch several new boats at the show, including a new Hurricane model, a new Sweetwater Tuscany and a new Rinker 310 express cruiser. Another manufacturer adding space this year is Cigarette Racing Team, which increased its booth area to 9,600 square feet from 6,000 square feet in previous years. A new Cigarette inspired by Mercedes AMG is premiering at the show. "It&apos;s the one show where we know we&apos;ll get the most visibility and the most bang for our buck," says company spokeswoman Marilyn DeMartini. Bentley Collins, vice president of marketing and sales for Sabre Yachts and Back Cove Yachts, says it&apos;s increasingly difficult for builders with dealer networks to put boats in the show because of the inventory financing squeeze, but he says his company is working hard to put together a display of five boats. "We recognize that Miami is the most important winter show for any of the builders," he says. "In terms of national and international press, dealer visits from overseas - Miami&apos;s important, and we know that." About 100,000 people are expected to attend the show, which would be an increase from the 96,736 who came out last year. The 2009 turnout was 26 percent below the 2008 attendance figure. "Our bellwether will be the Fort Lauderdale show, which is a competitor to the [Miami] show in some degree," Rick-Joule says. "They had a very strong attendance, and that will play very well for us. We&apos;re hopeful that we can remain at least static with last year, which is right around 100,000 people." DeMartini agrees that the better-than-expected turnout at Fort Lauderdale bodes well for Miami. "Fort Lauderdale was much better than anybody anticipated," she says. "We came out with two new boats and had a very good turnout, and we think that Miami will be even better." Viking Yachts director of communications Peter Frederiksen says his company also had a better-than-expected Fort Lauderdale show, which could mean good things for Miami, where Viking will showcase 16 or 17 boats, including the premiere of the 76 Enclosed Bridge Convertible. "Right before Miami, we have our own little VIP event at our facility in Riviera Beach, and we&apos;re getting a lot of responses to our invitations," he says. "That&apos;s a good sign. "We&apos;re trying to remain upbeat because I think it&apos;s important to remind people, hey, we&apos;re still building Vikings, and we still have people working here. We haven&apos;t shut our doors," Frederiksen says. Mercury Marine will use the Miami show to introduce its new 8.2-liter "next generation" big-block engine and its new ECO-Screen, a SmartCraft feature that helps maximize fuel efficiency. Company officials are expecting decent crowds at the show. "I thought the media was especially attentive to Lauderdale, and the crowds were better than I expected at Lauderdale," says Mercury spokesman Steve Fleming. "What we&apos;re expecting from Miami is probably a pretty good show. I think that we all know that the boating industry is probably going to take awhile to recover and might never reach the stages that it once was, but it is showing signs of life. Here at Mercury we feel pretty good." The NMMA Advantage program, which the trade organization launched at its fall shows, will make its Miami debut. The program allows consumers to see specific models that will be on display and schedule appointments before the show. "[Manufacturers] have got to be able to start getting rid of whatever inventory they currently have so they can start getting new boat lines in, getting more models in, ordering stuff," says Rick-Joule. "We&apos;ve got to get the circle moving again, and we really think that this is going to be a way to help." Though exhibitors cannot display used boats at Miami, a mix of new non-current models not older than 2008 will be allowed, she says. As of late last year, however, no manufacturers had indicated they planned to show anything other than current model-year boats. Also new this year is a five-day pass for $75, Rick-Joule says. Admission for Premier Day Feb. 11 is $30, and a two-day adult pass valid Feb. 12-15 costs $30. Single-day admission is $16 for adults and $6 for children 13 to 15 years old. There is no charge for children younger than 12. Some of the features returning this year include the Affordability Pavilion, showcasing boats that can be financed for $250 a month or less; the Big Game Room; the Discover Boating Center; the Miami Herald Discover Boating Photo Contest; and Miss Geico. 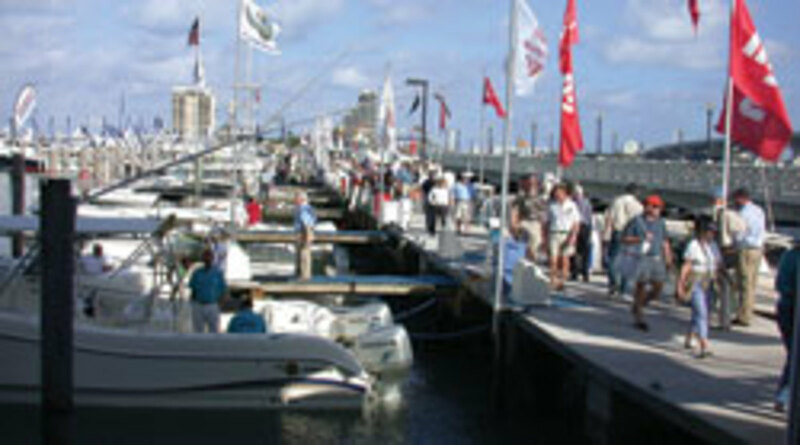 For 2010, the Strictly Sail Miami Show is moving to Sea Isle Marina from its traditional location, Miamarina at Bayside. "The change was necessary," says show manager Kevin Murphy. "The demand for space was much less than usual, and we were looking at two marinas that were only half full. "It made a lot more sense to move the sailboats over to Sea Isle than to try and move the powerboats over to Bayside, where there just wouldn&apos;t have been enough slips," he adds. "It was a very difficult decision, but it was something that was necessary." Exhibitors had been down 20 to 25 percent at each location, he says, but moving will ensure the single venue is filled to capacity. Murphy says the upside to the change is that sailing exhibitors will see all the people coming to the powerboat show that they never would have seen otherwise. "There&apos;s going to be an additional 20,000 to 30,000 potential buyers passing by their booths and taking a look at their boats that they never would have seen at Bayside at an all-sail event," Murphy says. Murphy says the large drop in the number of sailboat dealers in Florida made it difficult for exhibitors. One dealer, he says, will be representing Hunter, Catalina and Island Packet, which is unusual and a "huge strain" on that dealer. Murphy says the 2011 dates are on hold at Bayside, and the hope is to move back to the traditional location. For information on the Miami International Boat Show and Strictly Sail Miami, visit www.miamiboatshow.com or www.strictlysailmiami.com. For more on the Yacht & Brokerage show, visit www.showmanagement.com.